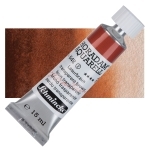 Pigment Brown 41 offers good covering strength and medium tinting strength. It is transparent and heavily staining. These properties are ideal for watercolor painting, where a transparent brown has traditionally been achieved by mixing other pigments. Pigment Brown 41 has very good to excellent lightfastness. Although no acute toxic effects are known, possible hazards of chronic exposure have not been well studied. Pigment Brown 41 has been used to color paints and plastics. It one of a series of disazo condensation pigments synthesized and commercialized late in the 20th century.